I am home after a whirlwind trip to the Bay Area. A friend of mine, Michael Gaffney was doing a reading of the one man show he’s been working on for a few years now and because I’m not working and I could, I decided to drive up for it on Monday and come back last night. He lives in the East Bay and the show was in Berkeley. I thought I was going to head home yesterday morning, but the City by the Bay called to me. I could not be that close to San Francisco without crossing that bridge, both literally and metaphorically. So, I drove first to Coit Tower. I parked on Sansome, I think, and decided to climb the Filbert steps to the Tower. I huffed and puffed my way to the top, and enjoyed the lovingly restored structure with WPA murals and an ancient Otis Elevator and took several pictures from the observatory deck. And then I took another set of steps down, back to my car. As I was pondering the mixed blessing that living in one of these Telegraph Hill apartments would pose, I noticed a plaque, in a garden. 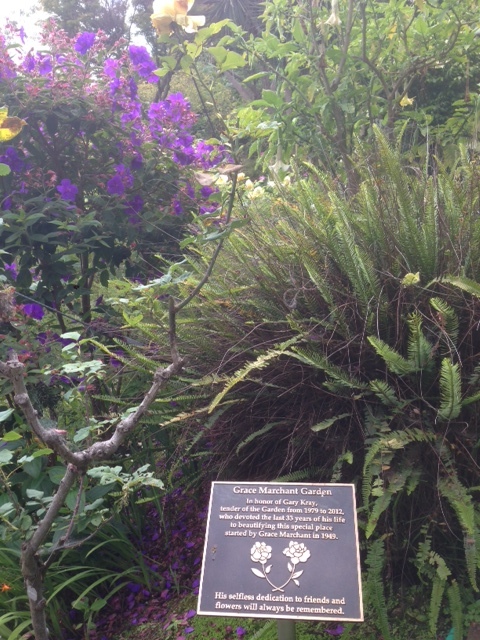 This was Grace Marchant Garden and the plaque itself was to honor a man named Gary Kray who tended to the garden from 1979 to 2012. “His selfless dedication to friends and flowers will always be remembered.” Of course, I wondered if Gary Kray might have been gay, reasoning that any man who tends to a garden, in San Francisco, for 33 years, well, it’s possible, if not likely. This morning, I found his obituary where a friend shared that Kray’s big loves were San Francisco, Paris and the British Monarchy, so, you can draw your own conclusions. His obituary also told me that he worked nights as a cab driver so he could maintain his garden during the day. I thought about the sacrifice he made for doing something he loved and how that sacrifice touched the hearts of so many people. And his work lives on. Anyone, tourist or local, can stop and enjoy the flora and fauna as they take in the spectacular views: it’s a legacy. After a quick visit to the Sutro Baths and the fairly new incarnation of the Cliff House, I headed to the Castro for a quick lunch before hitting the road. I walked by The GLBT History Museum, and thought, this is my solo San Francisco adventure, I should check this out. It’s basically one large room and one could spend 15 minutes or a couple of hours there. What struck me most was the section dedicated to Harvey Milk. There was a hologram image of Milk and a blue button with instructions to push the button to listen to an excerpt from his famous tape recording that is featured in the film Milk, where he surmises that an assassination might be imminent and he conjectures what his legacy might be in the event of his death. I had turned away from the hologram as I listened to his words, while looking at pictures and artifacts, I heard him talk about someone from Altoona, Pennsylvania who called him, sharing that Milk’s election had given him hope. Harvey Milk also offered that, if he was assassinated, he would hope to see “every gay doctor come out, every gay lawyer, every gay architect come out, stand up and let that world know.” As I pondered his legacy, I turned around and noticed that the hologram was gone and through the glass, I saw a blood stained suit laid out. My response was surely the curators’ intention because I was truly shocked by its presence. 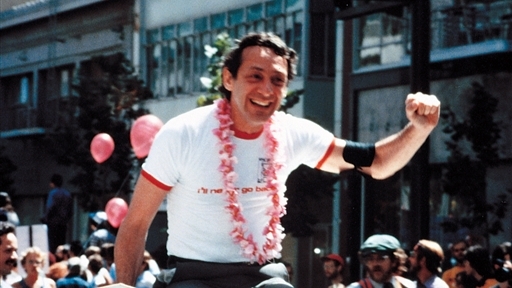 As Harvey Milk continued to speak, I scanned the crimson soiled shirt and tie and jacket. As I became a bit emotional, his words were both a salve and a call to action. His life and death affected and inspired so many people, all races, all sexual identities, all ages. I thought about Gary Kray and Harvey Milk as I drove down the 5 last night. How these San Franciscans had had these very different, but enduring legacies. They both were a product and a tribute to a city that holds many treasured memories for me. I must confess now that I’ve buried my lead, and I did it on purpose. Because even more than Gary Kray and Harvey Milk, the person I thought about most as I travelled home was my friend Michael. He’s been the subject and guest star in several of my blogs as well as an occasional guest blogger. His show, at Berkeley Playhouse, a one night only event (so far), was a staged reading of his solo memoir The Oldest Living Cater Waiter: My Life in Three Courses. While he’s been a professional actor for over 25 years, he’s also been a cater waiter for several years. His story is about the juxtaposition of the two careers, the two worlds. It was something I clearly related to, having worked in restaurants, on and off, since I was 19, but it’s a universal theme. Who among us can say that our lives have turned out exactly the way we thought they would? Michael’s story made me laugh and cry, with honesty and humility and passion and tenacity. It must also be noted that the theatre (designed by Julia Morgan, btw) was filled by other artists and cater waiters and artist-cater waiters who love and root for Michael as much as I do. I think it’s rare for someone to be as loved, treasured as he is. I’m so proud of the work that he’s done on this show and I look forward to the next chapter. So, three men. Three very different legacies, but they were the men who permeated my thoughts and even spoke to me on that long drive home last night. I remembered another famous speech by Harvey Milk, about giving people hope, its importance, and how each of these three gave and give me hope in their own ways. It could have been a lonely trip, but I felt I was in good company. Your kind and thoughtful blog brought such tears to my eyes. I am indeed a lucky man, because I have friends such as yourself in my life. wonderful depiction of the city i love, of a few of the people who have made it fabulous, and that crazy, funny, endearing human being, mike gaffney, who never met a person from whom he couldn’t coax a smile or better yet, a deep, full throated belly laugh! thank you for sharing your thoughts! Please remember that Harvey was not the only pioneer in the Early S.F. gay rights movement,and that his powerful speeches where not written by him. I recommend a great web-site that is dedicated to the evolution of the Castro,from a sleepy working class neighborhood in the Eureka Valley to America’s gay mecca. http://www.thecastro.net and while there please visit my pages.